After scoping out all of the tables with Howard cards available, and after making my initial purchase, I headed back to one of the tables covered in monster boxes of cards in top loaders, where I knew there were several Howard cards I wanted for my collection. Two cards in particular caught my eye so I grabbed a 05-06 Beehive rookie and a 05-06 Parkhurst rookie for $10. I know I probably overpaid, but I think it may work out assuming I would've paid at least $2 to ship each of them if I were to get them on ebay. I never really knew much about these Beehive cards back when they came out, but they're starting to grow on me. There's something about the simple old-school design I just can't get enough of now. I just need to work on tracking down all six or so parallel versions. One thing I really like about this Parkhurst rookie is the fact that the picture on the card was taken later in the 05-06 season, as Jimmy is shown with his first Red Wings themed mask and set of equipment. Then, on the way back to the first table where I planned on grabbing a few more singles, I found two more that caught my eye from a table across the aisle. This time I got a 05-06 Beehive red border rookie and a 10-11 Donruss The Goalies acetate insert card. Again, I like the simplicity of these Beehive cards. This one is nice because the Beehive text only takes up a small area in the upper corner, leaving the rest of the space inside the border for a nice closeup of Jimmy and his Maine mask. This next one is neat because it's the first acetate card I've added to the collection. It's a Goalies insert from 2010-11 Donruss. That's eight down, four to go. I'll have those scanned and ready to go in the next day or so. I've saved the best for last, so stay tuned for the biggest addition from the show. Garage sales are good in my mind for one reason and one reason only, never knowing what you'll find. This is another one of those things that is more than worth the sticker price, even if it's just to get kick out of not knowing what you have. This team bag is supposedly filled with 25 different cards. 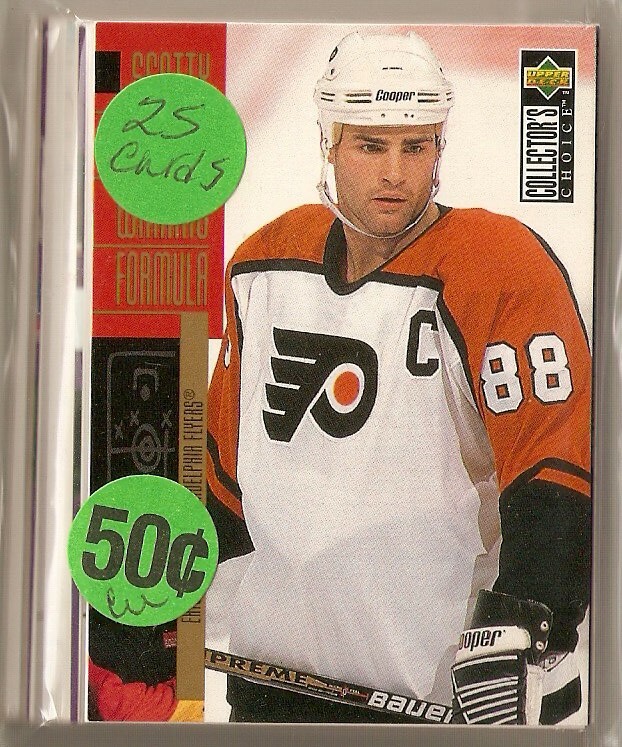 I know the front is this Eric Lindros and the back is a Steve Yzerman from 98-99 Black Diamond. Other than that I don't know, I haven't even opened it up yet, which is the fun thing about this post. You'll have to wait and see what's in there. As you have probably read in my last two posts, I made it out to the Gibraltar Trade Center for another card show this past weekend. While I was there, I managed to add 12 new pieces to my growing Jimmy Howard collection. The first purchase I made brought me these four for only $10. The first is from 2006-07 Between The Pipes, depicting Jimmy in his first pro season with the Grand Rapids Griffins. He's even still got his Maine mask in the picture on this one. The second was this 20th Anniversary parallel from 2010-11 Upper Deck. I love these cards as they use the exact same design as was used 20 years ago. It's kind of neat for me because I remember these being very prevalent in my collection when I was first collecting as a kid in the mid-90's. This next one is kind of bittersweet. Once I knew Howard was going to be part of the Pinnacle base set this year, I was looking forward to what kind of picture they would use on the card, and then I saw it. This is the exact same picture as the UD Series 2 picture, which I believe came out first. Now I know I can't really complain about it, but how hard is it for Panini to use a different picture than UD? So at this point, that's two base cards and one base card parallel. Doesn't really add up to spending $10 does it? Well, the last of these four makes up for that. It's a hard to find black parallel from 2009-10 Victory. I'm not sure of the exact print run of these, but I've only seen one on ebay, so I'm definitely glad I was able to knock this one off the want list. Earlier this week I mentioned I was planning on heading out to Mt. Clemens, MI for another card show at Gibraltar Trade Center. I got to the show around 2:00 pm and surprisingly it wasn't all that crowded. There were probably somewhere around 50 tables set up, of which I found eight or so to be appealing and three to be useful. As far as the appealing and non-useful tables, two were nothing but wax boxes, which I told myself I wasn't going to get sucked into this time around. The one thing I did notice at one of these tables is that I definitely bought my box of Certified at the right time back in January. I got it for $80 then and it was stickered for $115 now. I guess that's what supply and demand will do for you. As far as the useful tables, two of them had primarily Red Wings stuff and the other had monster box after monster box of cards marked anywhere from $1 to $25. Between these three tables, I ended up making four purchases for a total of 12 new additions to my Howard collection. I got a few rookies and some inserts among other things, which I will share later. Since I started this whole blogging thing, I've made it out to two card shows. That doesn't seem like all that much for a year and a half, but aside from heading to the national expos, this is the only practical card show for me to attend. The one coming up this weekend is again at The Gibraltar Trade Center in Mt. Clemens, MI. It's nice because this show is only about an hour drive from my place and it's the only one I can find around here that takes place on a regular basis. It's usually a decent sized show, as you can see by the picture I grabbed from their website, which is nice. The only downside for me is the fact that Red Wings stuff, and therefore and Jimmy Howard stuff, is over priced. Regardless, this time I'm going in with a pretty extensive want list for my Howard collection. I'm hoping to knock a few base cards off the list and possibly some of the higher end stuff. One thing I do want to do is avoid buying any boxes this time, although sometimes the deals are pretty tempting. I would much rather take the money I would spend on a box and put it towards singles for my Howard collection, as the last few boxes I've bought haven't exactly been worth it. So if anyone is in Michigan this weekend, be sure to check it out. When it comes to hockey cards, everyone knows the following two names: Sidney Crosby and Alexander Ovechkin. That said, it is damn near impossible to find a good deal on any unopened 2005-06 product because of these two. 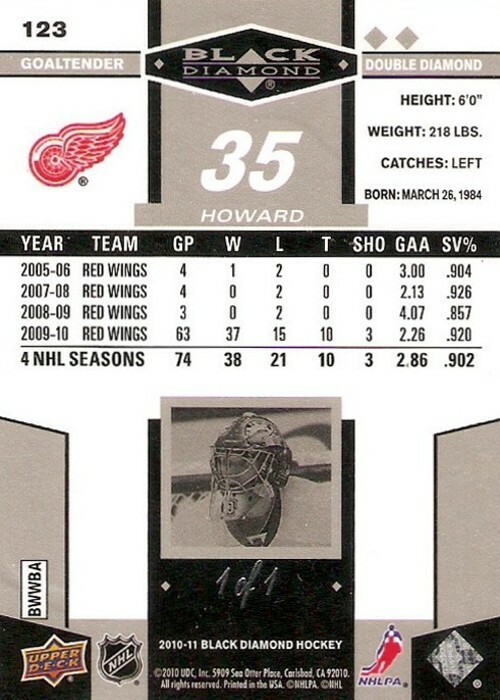 This becomes a problem for people like me with a PC guy (Jimmy Howard) whose rookie year was 2005-06. Other candidates, just for Red Wings fans alone, would include Johan Franzen, Valteri Filppula, and Brett Lebda. 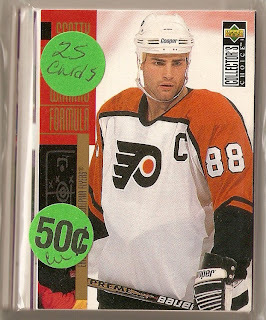 For example, say I wanted to pick up a case of The Cup in hopes of pulling a nice rookie auto patch. Let's look at two cases here: Jimmy Howard for 2005-06 and to keep things in Hockeytown, Daniel Larsson for 2009-10. If I wanted to buy a six-box case today, on ebay it would cost me $5,195 for 05-06 and only $2,499.95 for 09-10. That's more than a 2X increase in price for a product that is four years older, all because of Crosby and Ovechkin. The Cup is obviously the highest end example of this, but the curse trickles down through other product lines as well. Even Upper Deck's flagship product sees a giant increase. Today it would cost me $314.99 for 05-06 UD Series 1 and only $91.99 for 09-10 UD Series 1. Anyone else faced with the curse? I know there are a ton of great rookies from 2005-06. A short list of some of the bigger names would include: Dion Phaneuf, Mike Richards, Ryan Getzlaf, Thomas Vanek, Mike Green, Duncan Keith, and Corey Perry. I don't really know what to say here, but this is by far the best mail day I've ever had as a collector. As the title of the post suggests, I've finally acquired my very first 1/1, a Platinum Jimmy Howard from 2010-11 Black Diamond. I've been collecting Jimmy for just over 13 months now, but my collection still isn't all that impressive, yet. I've got a few rookies, two auto's, a bunch of base, and have yet to pick up any game-used stuff. Is it just me, or is it kind of odd that I now have a 1/1 before I even have a simple, even one-color, jersey card? Not as exciting as you would think, is it? It's pretty much the exact same as the base card, except this one has a bit of a rainbow tint to it. I wish it was a little more distinguishing, but I can't complain, a 1/1 is a 1/1 right? Anyway, here's the back of the card, where the all important serial number is located. I do like that on UD 1/1's it's actually written out "1 of 1" instead of just "1/1." Now, as far as what I paid for this one. I ended up getting it for $41, not sure if I overpaid or not. What do you guys think? I think it was worth every penny, as this is now by far the best card I own. Before anyone says anything, I know this is not a pure 1/1 (i.e. dual shields), but it is a parallel 1/1 and that is more than ok with me. 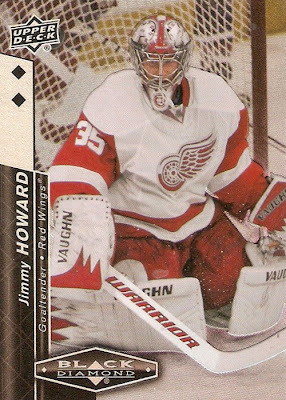 I may sound greedy or something here, but I absolutely love the fact that I am the only Jimmy Howard collector in the entire world that has a copy of this card. That's pretty cool if you ask me. Here's one last look at my new favorite card, this time in my hand, just to show that I really do have it now. I'm curious, what was your first 1/1 experience like? Did it come from a pack or from a purchase or trade like this one? With the lack of pickups around here lately, I thought I would dig through some more boxes of my base cards and post a few more of My Picks. 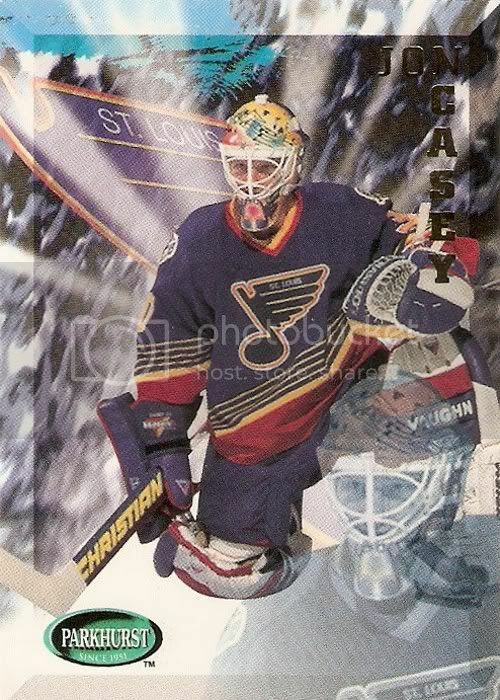 This one featuring former Blues goaltender Jon Casey comes from another great 90's set: 1995-96 Parkhurst. When you first look at this card, there is a lot going on. First you've got a nice full color picture of Casey kneeling down along with a blown-up, faded version of the same picture on top in the corner. The background definitely pops on this one, with a pretty scattered pattern as well as a kind of light burst effect coming from behind Casey. Add to that a tilted Blues logo that is partially covered and you've got a variety of design elements. One thing I like is the way the player first and last names come together in the upper right corner, just inside of the outer frame of the card. It's just a little hard to read the gold foil from the scan. I like this set in general because when you look at it, it's not something you would expect to come from the Parkhurst brand, and I'm always a fan of card companies trying something different. I've been at this whole blogging thing for a little while now (nearly two years) and throughout that time I've gone through plenty of collecting phases. Those have included player collecting, set collecting, TTM, goalie-only collecting and simply buying packs and boxes just for the sake of opening them. Well, I've kind of hit a wall and thought I need to change things up. I know it's common sense that when player collecting, busting packs and boxes is not the best way to add to your collection. However, I still find myself buying needless packs and boxes just so I can open them (i.e. the Certified and Artifacts boxes I posted in January), instead of taking that money and putting it toward singles for my player or set collections. I guess I just get sucked in by the allure of pulling an amazing card, but that never seems to happen. I hate to think about the money I wasted on some of the boxes I purchased in the past, especially the number and quality of cards I could have added to my collections. If you've been following my blog, you may notice something missing from this list. That would be my Dominik Hasek collection. Well, after only adding three nicer pieces and a ton of quarter box pickups since I started the project, I'm officially abandoning it. I'm not complaining, but there are just way too many Hasek cards out there to continue actively going after him, even though he was my favorite player growing up. There are no set rules for collecting, that's one thing I love about this hobby, you can do whatever you want, and this realignment plan is what I want to do, for now. I'm part of the player collector crowd with my Jimmy Howard project and lately I've had 1/1's on my mind. Up until recently, I had only come across one of them on ebay (not counting the mislabeled 1/1 printing plates) that went for a pretty good price. Now, in the last two weeks I've come across three of them. I bid on one only to be outbid by $0.50 at the very last second. That may have been the most pissed off I've been about an auction ever, which is part of the reason for this post. It got me thinking about how much I should actually care about pursuing 1/1's as part of my Howard collection, or any player collection for that matter. Part of me is upset because I will most likely never see that card again, but at the same time the other part of me thinks how can I realistically expect to get every Howard card ever made? There are just so many 1/1's and low-numbered parallels today it's ridiculous. That being said, I don't think it's unrealistic to think I can acquire at least a single 1/1 for my Howard collection, right? What do you guys think about counting all of these 1/1's toward your player collection totals. At this point, I don't include them because I know I will never have them all. I'm guessing that's the norm, but I wanted to get some other opinions on this one. There's definitely been a lack of posts around here lately, mostly because I haven't made any additions to any of my collection projects, but also because of a few side projects I'm working on. Hopefully I'll be able to get them up and running soon and be able to share them. Anyway, it seems like it's been forever since any of my TTM requests have come back, so it was a nice surprise to see one of my SASE's in the mailbox the other day. This one adds three cards of another goalie to my growing TTM collection. I sent these three cards to Arturs Irbe c/o the Washington Capitals, where Irbe is a goalie coach, back in July of 2010, so this one took almost a year to get back to me. Here's the first one, from 1993-94 Topps Premier, featuring Irbe with the Sharks, where he spent his first five NHL seasons. Here's the second one, from 1997-98 Score, featuring Irbe with the Canucks, where he only appeared for one season playing 41 games. Finally, here's the third one, from 2001-02 Topps, featuring Irbe with the Hurricanes, where he would finish his NHL career playing 10 games in 2003-04. This was a good success, one goalie, three different teams, too bad I didn't have one featuring him with the Stars, oh well. I also really like the fact that Arturs switched up the number according to what he was wearing in the photo on each card. Here's a cool Irbe tribute video I found on YouTube. Check it out.